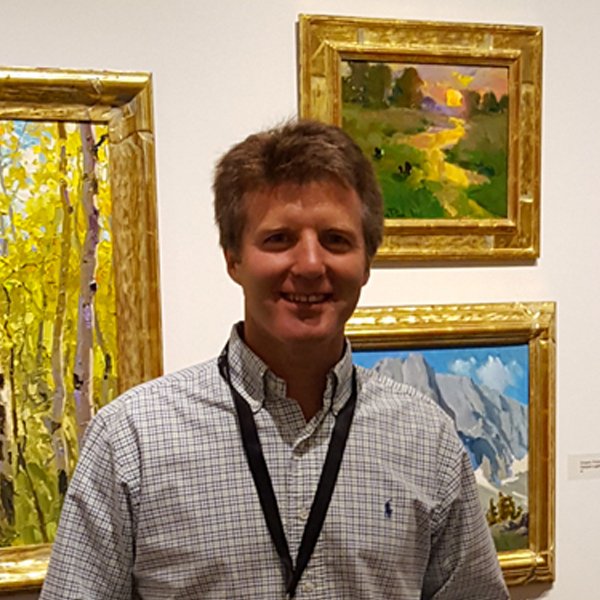 An American Impressionist, Gregory works each day to paint in the vein of the impressionists. “I wish to carry on the conversation begun by Monet, and I believe there is still much to be said”, says Gregory. Having been an avid drawer while growing up it wasn‘t until 1998 that Gregory began painting in earnest. After 18 years of painting more and more his work is infusing the stately quality of the traditional impressionists with his own unique approach and subject choice. Growing up with a love for drawing, Gregory's first painting experiences came later in life where in college he took a couple painting classes as he earned his bachelor's degree in English. For a year while working and attending college he and a friend rented an art studio simply to paint and draw for fun as they had time. It wasn't until age 28, six years after those first real painting experiences that he finally decided to open the door again to the undying urge to be an artist. He took back-to-back painting workshops from notable artists Robert Moore and Delbert Gish and became enamored with the work of the California and Russian impressionists. With passion ablaze, he and his wife began the difficult and unending journey that many artists before have traveled. He furthered his studies with painters Robert Johnson and finally, and probably most notably, with Ovanes Berberian. After many years with his wife's encouragement and support, early in 2005 his wife was able to trade jobs from being a Physical Therapist to being a stay-at-home mom and Gregory started painting full time. With a son and a daughter, Gregory prefers to travel and paint with his family or paint near home.